What makes a ‘Real Good Yarn’? This ethical yarn directory has been compiled as a result of conversations with suppliers, recommendations and online research. It details yarn suppliers who take extra steps to care for animals, people and the environment. I don’t audit the suppliers and there’s no standard certification process. I suspect that as I learn more about the ethics of the world of wool and yarn that the listings will change. I certainly hope that a lot more suppliers of ‘real good’ yarn will be added. If you have any specific questions or want to find out more about a particular yarn then please contact the supplier directly. If you know of suppliers that I should add to the directory then please let me know. I hope you enjoy your exploration of Real Good Yarns. 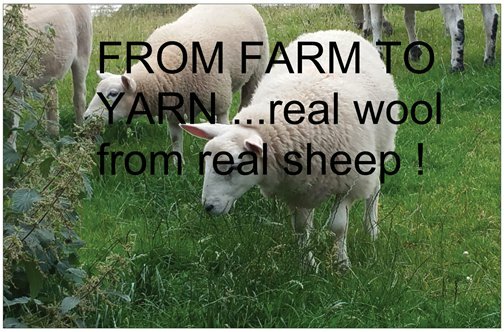 Beautiful natural wool from heritage and conservation grazer flocks of sheep in Lancashire, North West England. Woolly Chic sells a beautiful range of 100% British wool, Fairtrade cotton and unique Crochet and Knitting Kits to suit all abilities. Click here to opt out of Google Analytics .